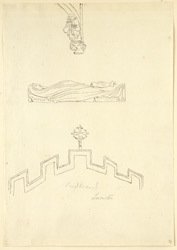 An outline sketch in ink of architectural details of parts of Loughborough church in Leicestershire. The statue at the top is taken from the nave, the arch at the bottom from the chancel. The monument to an unidentified woman and her child is taken from a chapel off the nave.